Various natural and anthropogenic (human-caused) factors contribute to global warming. This graphic shows the percentage contribution of solar variability to global warming for 2 time periods, the past 100-150 years (left) and the past 50-65 years (right), from various peer-reviewed studies (colors). 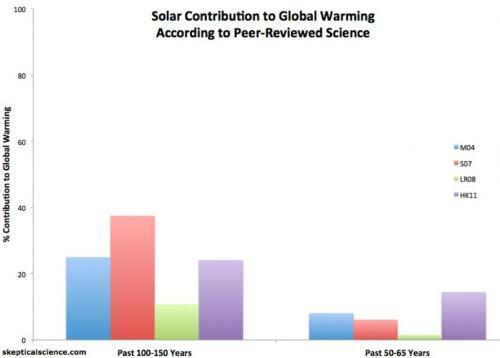 The studies find a relatively small solar contribution to global warming, less than 40% (0.3°C) of the observed warming over the past century, and less than 15% (0.1°C) over the past 50 years. The studies are Meehl et al. 2004 (M04, blue), Stone et al. 2007 (S07, red), Lean and Rind 2008 (LR08, green), and Huber and Knutti 2011 (HK11, purple). Also see this graphic for a summary of all natural and human contributions to global warming.